The iPad has been adopted readily in the music industry by people who are already musicians and by people who want to be musicians. You can do all kinds of neat things with the iPad with the right app. Plug in a guitar with a guitar interface and use it as an effects processor. Record and tweak music using your iPad as a digital workstation. Turn the iPad itself into a musical instrument or learn an instrument using the iPad as your teacher. Where should you start on all of this musical goodness? Try some of the highest-rated iPad apps available for musicians. Turns learning to play an instrument into a game. You can load your own songs into the app. Includes lessons for guitar, bass, ukulele, and piano. Lacks variety and becomes repetitive after a while. Subscriptions are pricey and noncancellable. Can appear crowded on small iPad screens. If you are new to your music instrument, Yousician is the perfect app. It's free to download but requires a monthly or annual subscription after a trial period. Even if you have been playing a while, Yousician can be a handy tool. The app allows you to play along with it in a manner similar to music games like Rock Band. However, instead of notes coming straight at you, the notes appear on the right and scroll to the left. This is similar to reading music and almost the same as reading tablature, so if you are learning guitar, you learn to read tab at the same time. For piano, the music sheet flows similarly, but you get a cheat sheet of a piano's keys lighting up to help you out. A beautifully simple and stable app. Excellent for organizing and cataloging music. Includes nice extras for musicians. Displays sheet music only in PDF format. Works with collections, but each song must be bookmarked. Fans of the forScore app declare it is the best music reader anywhere. Its clean interface looks like the app was designed exclusively for iOS devices, and it was. Use it to download sheet music or load PDFs on the iPad and be playing in seconds. The forScore app partners with Musicnotes to give instant access to purchases. You can annotate, play along with an audio track, and create set lists. The app supports split view and slide-over multitasking on iPads with these features. Play hands-free with forScore's page-turning devices, and MIDI signals or use its built-in remote control. Serious collectors can add composers, genres, tags, and labels to each score's metadata in the library. Best of all, you can take your entire sheet music library with you wherever you go. Excellent app for tuning guitars. Chord libraries and metronomes aren't special. Free version includes only standard six-string guitar tuning. Is your ukulele out of tune? How about your mandolin, banjo, or bass guitar? You need GuitarTuna, the premiere tuning app for all stringed instruments. It's easy, fast and accurate — even for beginners. GuitarTuna offers more than 100 tunings, including standard, Drop-D, half-step down, and 12-string. The app also includes a metronome, chord-learning games, a chord library, and four practice songs with guitar notation. Great job recreating analogue Moog sounds. Dozens of presets to play with. Interface feels like a tool and not just a display. Steep learning curve for anyone not familiar with Moog hardware. It doesn't sound exactly like Moog hardware. Synthesizer fans love Animoog, a polyphonic synthesizer designed for the iPad. Animoog includes waveforms from classic Moog oscillators and allows users to explore the space of those sounds fully. It's not cheap, but for those who want a true synth experience out of their iPad, Animoog is the way to go. Animoog supports MIDI in, so you can use your MIDI controller to create the sound or use the touch interface. Jamming on this app delivers top-notch sounds. Lots of instruments, scales, and keys to choose from. Steep learning curve for novices. ThumbJam is a virtual instrument designed specifically for the iPad, iPhone, and iPod Touch. Rather than provide an on-screen keyboard linked to instrument sounds, ThumbJam turns your device into an instrument. By picking out a key and scale, you can use your thumb to move up and down the notes and wave the device to provide different effects such as pitch bend. This makes it a unique and intuitive way to "play" your iPad. Easy to record and mix music. Large built-in sound and loop library. Includes lessons for guitar and piano/keyboard. Others are downloadable. Lacks depth when editing parameters. No view of the mixing console. Easily the most popular music app, GarageBand packs in plenty of functionality for a relatively low price. First and foremost, it is a recording studio. 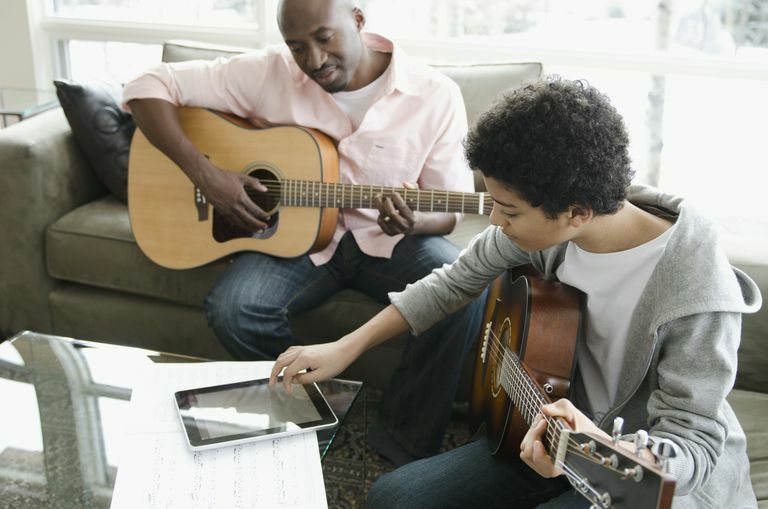 Not only can you record tracks, but you can also play with buddies remotely through virtual jam sessions. If you don't happen to have your instrument with you, GarageBand has virtual instruments. You can use these instruments with a MIDI controller, so if tapping on a touch device doesn't give you the right feel for making music, you can plug in a MIDI keyboard. Best of all, GarageBand is free to anyone who has purchased an iPad or iPhone within the last few years. More than 100 free instruments. Needs clearer instructions for novice users. Trash folder deletes files slowly. Music Studio is for people who like the concept of GarageBand but feel constrained by its limitations. The basic concept is the same: provide virtual instruments in a studio setting that allows for the creation of music. Music Studio goes further and adds more sequence features, including the ability to edit tracks, add effects, and draw in additional notes with the digital pencil tool. Music Studio has a comprehensive range of downloadable instruments, so you can expand your sounds as needed. It's fun, and it sounds great. Lots of drumkit samples included. Easy for nondrummers to operate. In-app purchases in a paid app. Lacks swing control for individual beats. One area where the iPad excels is as a drum machine. While playing a virtual piano or guitar on the touch screen can be a little awkward with the lack of tactile sensation leading to missed notes, the touch screen provides a good imitation of drum pads. You might not get the touch sensitivity or advanced features of actual drum pads, but for anyone who wants to tap out a beat, DM1 is the next best thing and far cheaper than a real drum machine. Along with drum pads, DM1 includes a step sequencer, a mixer, and a song composer. Works with almost any instrument: stringed, woodwinds, brass, timpani, and more. Ads appear in the paid app. Not useful when at noisy gigs. Needs presets for standards tunings. InsTuner is a chromatic tuner that works with any stringed instrument. The app features the standard frequency gauge as well as a fixed note wheel, which gives you a nice visual feel for the pitch being produced. InsTuner supports tuning through the microphone or through line-in modes, such as using a guitar interface to hook your guitar to your iPad. In addition to tuning, the app includes a tone generator for tuning by ear. Buttons and wheel to alter the beats per minute. Easy to change pitch on one or more notes in a measure. The metronome is a staple in any musician's arsenal, and Pro Metronome provides a basic metronome that works fine for most musical needs. The app has an easy-to-use interface that allows you to set the time signature, use it in the background, and project a visual representation onto your TV using AirPlay. Great for learning new music. Option to slow down tempo while learning new music. Interface is not intuitive. It requires a trial and error approach. Guitarists who deal with tablature love TEFview. This tab library features MIDI playback with speed control, so you can slow it down while learning the song and speed it up once you have it mastered. You can also print out the tab from within the app and share files via Wi-Fi or email them as an attachment. TEFview supports TablEdit files in addition to ASCII, MIDI, and Music XML files. Good for basic audio editing. Easy to filter out background noice. Lots of filters and special effects. Interface not intuitive. New users need instructions. App doesn't save when recording is paused. Want to ditch the virtual instruments but keep the recording capability? No need to go with a more expensive option. Hokusai Audio Editor allows you to record multiple tracks, copy and paste sections of a track, and apply different filters and effects to your tracks. Best of all, the base package is free, with in-app purchases allowing you to expand the capabilities of the app with new tools like grain synthesis, time-stretching, reverb, and modulation.